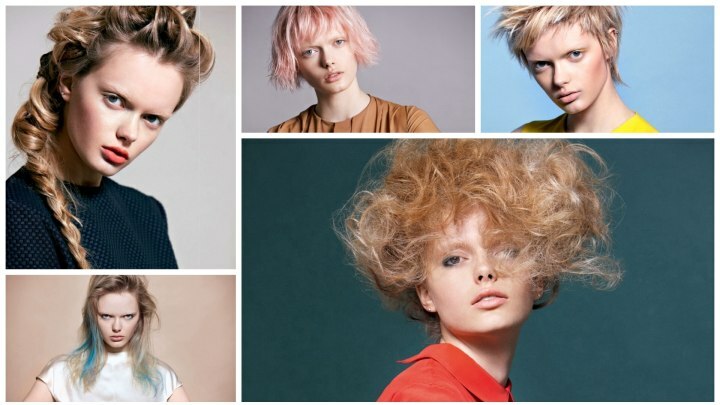 Inspired by the American painter Edward Hopper the new collection EVA by hair artist Laurent Decreton focuses on simplicity, contrasts and an almost poetic sense in hairstyles that comes to live with the use of splashes of color. The five styles also show an evolution of hair from long to raspy short, each one being a strong and distinct character. Solitude, isolation and contrasts have been a general theme in Hopper's work and now by translating it into hair, Decreton creates a new strength of expression that won't be solitary for too long. A picture speaks more than a thousand words and we invite you to get inspired, however a few words will be used to point out the specifics of each look. Starting on her crown a long braid was woven in the French braiding technique, which incorporates more and more strands in the progression of it until all hair is unified. Focus for this hairstyle was to create a soft and romantic look, therefore the hair was put together very gently and with much room to display a beautiful wave pattern around the head. The long part of the braid that was draped over her shoulder is also rather casual with ends sticking out creating a soft line and a playful attitude amidst all of the elegance and high fashion in this hairstyle. 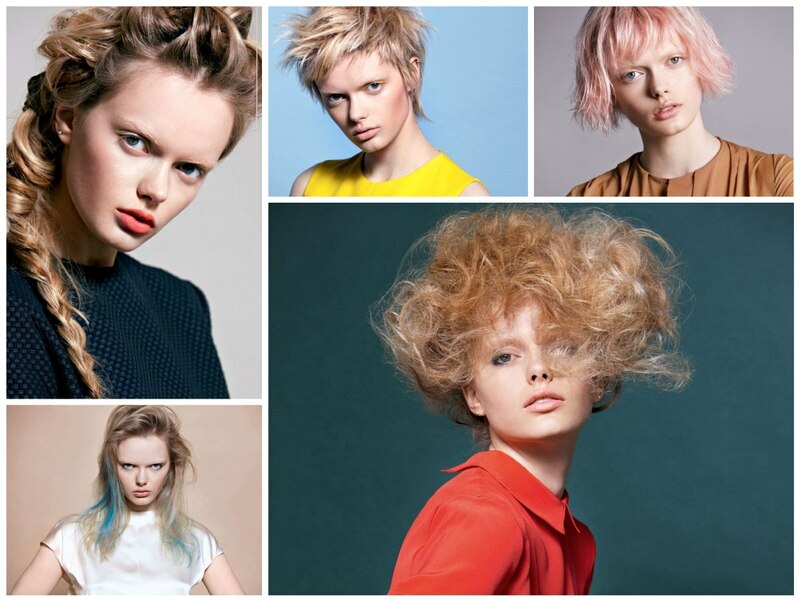 A splash of blue hair coloring shakes up the natural essence of a look that comes across as a modern "undone" style. The color sets the mood and is the main character in the long, loose and open hair. It was casually partitioned on the side, with a high wave above her forehead and fine layers floating down the sides. The electric blue color accent was applied in varying strength and stands out against her wheat blonde and slightly layered hair. This bob likes to fly and so in an appealing asymmetric shape. The about chin length hair was curled throughout and then small pins were used to support the hair on its high rising adventure. Find hairpins that match your hair color, this will make it easier to hide them as the style should look effortless and not too controlled. 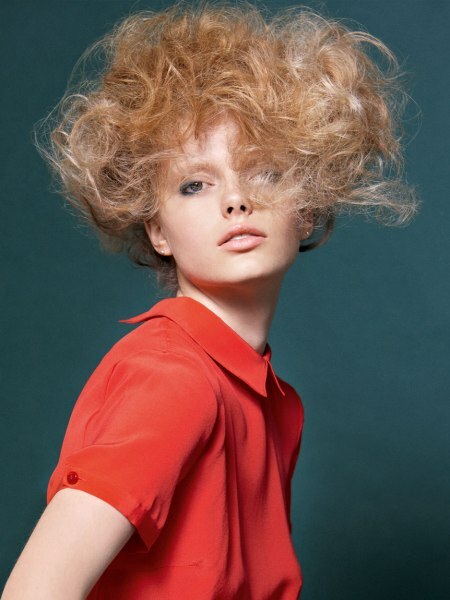 Teasing in the lengths and in the tips creates the fluffy and blurred texture, but it also aids with the hold of the hair in such lofty heights. Her hair color is a beautiful, deep golden blonde tone with accents in a silvery shade. 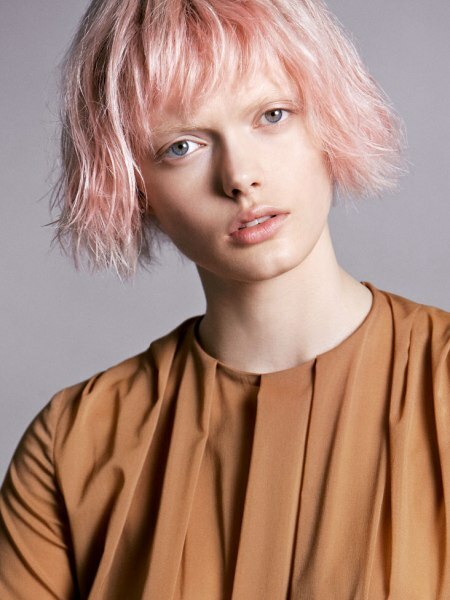 Texture and hair color work together to make this short hair so soft and alluring. 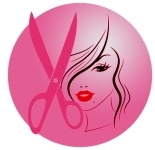 The tips were slice cut, which creates the variety of lengths and the fuzzy fashion of the cutting line. The same happened in the very short fringe. The hair color is more vintage rose than cotton candy and that makes the hairstyle so precious instead of overwhelming. A minimum of make-up and simplicity in wardrobe complete the enchanting nature of this artistic look. 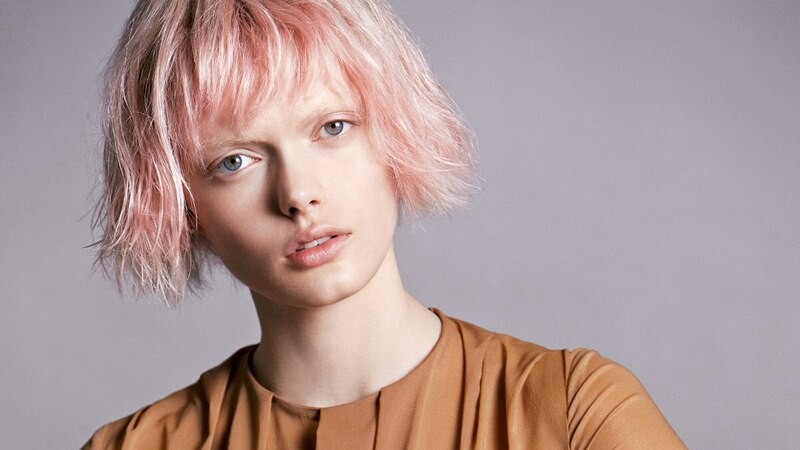 The rebellion is still in ever cuticle, but today's punk looks are much softer and playful. A seemingly random, but indeed well planned combination of very short and longer strands was textured to the extreme. This makes it possible for the hair to stand up in such a delightfully spiky way. Up and slightly sideways is the direction of the hair, which shimmers in a very smooth beige blonde. Shadows in the roots and highlights in the tips add more dimension to the pixie. One very remarkable feature is the fine extension in the neck and the few longer strands just before her ears.